Day 9: Here's where the painting was when I began this morning. I painted the sunflowers in front of this house during two different days while our house guests were here for Christmas/New Year's, but the photos of I took of those painting sessions (Days 7&8) got lost in the never-never-land of Tim's crashed computer. Fortunately everything else was backed up to his server! Nathan went happily back to first grade on Monday, January 4, 2010 after being off of school for two weeks, and our two sets of families have returned home after their Christmas/New Years visits. 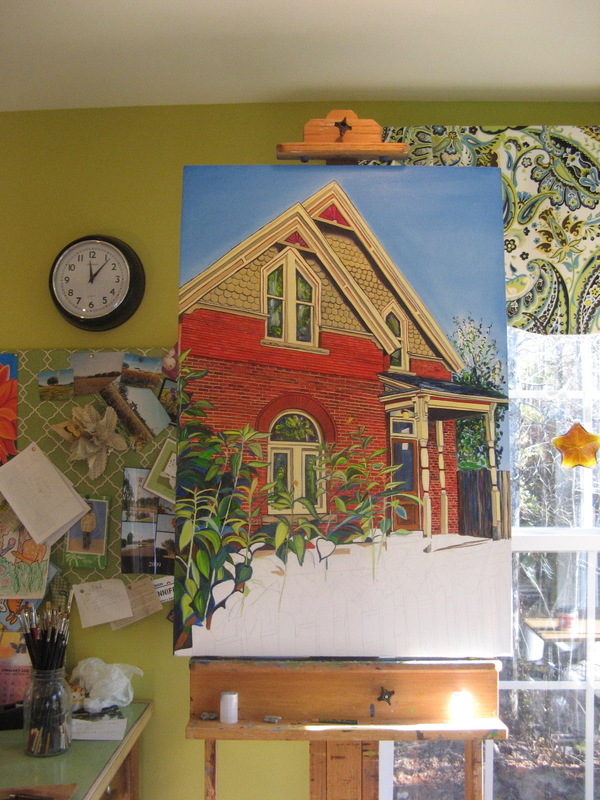 Our last remaining house guests left this morning, so as of TODAY, I am back to PAINTING! Then I MUST get my series of sunflowers of completed before starting any more NEW paintings. I like having a few paintings going at once, because it keeps me from overworking a painting. But right now I have five unfinished oil paintings in my studio, and that doesn’t feel so great. January will be my month to wrap up these five pieces so I can start on the landscapes I’ve been mulling over for the past several weeks. So I am very motivated to have “archer place” done and drying on my rack so that I can ship it to it’s new home. Over the next few weeks I will take some time to underpaint some of my new canvasses Bright Orange. I did that with “shore path” and “travelers rest” and they had a glowing quality about them that I loved. The orange will need to be dry before I begin the painting so that’s why I’m hoping to turn a few canvasses orange in January. 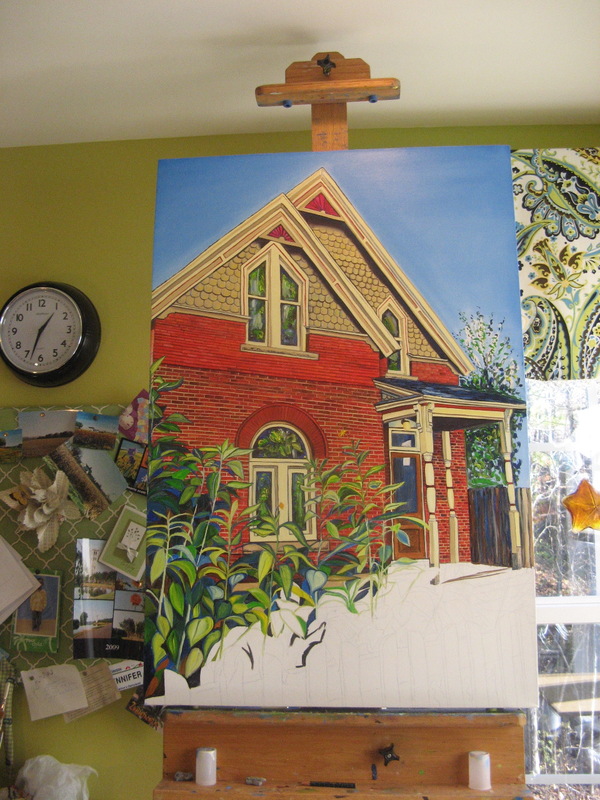 Still painting sunflowers and then filling in parts of the bricks behind the flowers. 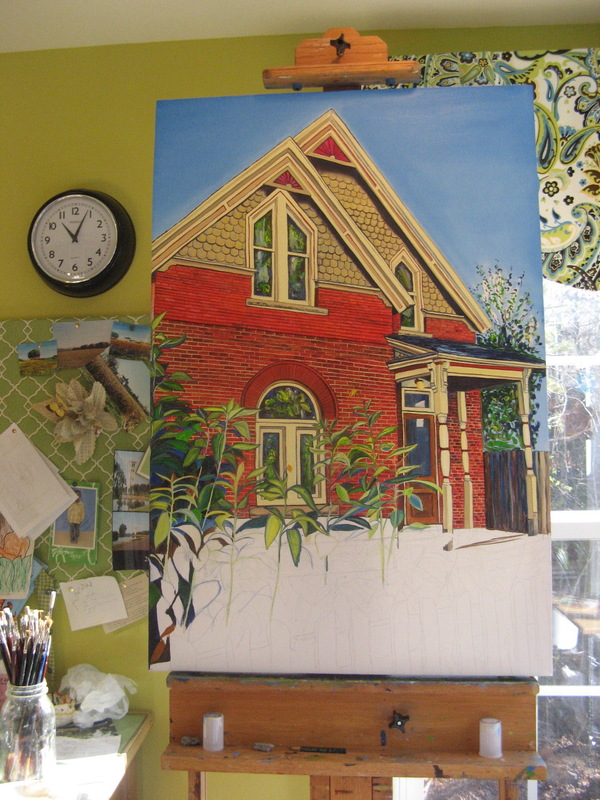 I ended up covering up a lot of the lower bricks with leaves, as the red poking through the leaves was too distracting. Painting all these plants is making me dizzy! It's a big tangled mess of leaves. I feel like the sunflowers are starting to FINALLY come to life. I realized I needed to add more deeper shadows to make the leaves pop. That seems to be making all the difference. Contrasts are very important! 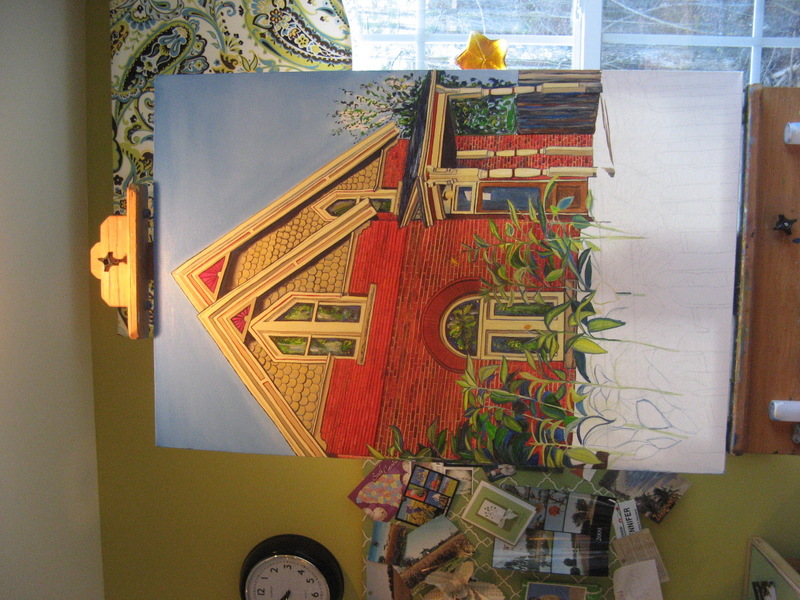 This entry was posted in "archer place", commissions, wet paint and tagged "archer place", artist marie scott, Denver, Greenville artist, greenville south carolina, oil paintings, painting an historic home, sunflowers. Bookmark the permalink.